Normally I keep my posts about The Golden Moth Illumination Deck in my other blog, The Golden Moth. But because this post also concerns my art-life, I'm reposting it here. I don't usually pull cards for myself. I used to quite often, but I found that in the past I relied too heavily on the cards and not enough on my self. The cards are a tool to access the self, but it can turn unhealthy when they start replacing trust in your own feelings and judgement. On the rare occasion when I have wanted a reading, I like to go to another reader for advice who can be more objective than I can be. But I've had the nagging feeling that I should pull some cards and see what comes up, and today I did. My reading was done on my art desk, and you can see some evidence of art-making in progress. I've been doing a lot of wondering and analyzing in the past couple months about this almost constant anxiety I have in my day-to-day life. One of the greatest sources of anxiety at the moment is my solo art show coming up in June. I don't have much time to create new artwork, yet not only am I trying to create all new pieces for the show, I'm also using a medium which is a bit more unfamiliar to me - printmaking on fabric. The processes alone are time consuming, and I've already spent a couple months just doing research about techniques and styles of fiber art - quilting in particular. It has been really fun to learn about and work in a new medium, but also daunting. I am also working part-time and teaching. I know many people who have schedules far more demanding than mine, but I am perpetually anxious about whether I can do it all. I have always preferred a more slow, relaxed pace to life but the demands of earning a somewhat stable income while also creating artwork make that difficult. I had the last couple of days off from work and thought I'd get a lot done, but I had a lot of trouble focusing due to the pressure I put on myself as well as feeling not quite sure about which step to take next in my art process. I asked the cards for advice about how to manage all my duties and my life leading up to the art show. In ancient Roman religion and myth, Janus (Latin: IANVS) is the god of beginnings and transitions, thence also of gates, doors, passages, endings and time. He is usually depicted as having two faces, since he looks to the future and to the past. The Romans named the month of January (Ianuarius) in his honor. At first glance, I thought this card showed an element of busy-ness. The figure seemed to be looking back and forth rapidly, constantly switching from one thing to another (for me - my various obligations, as well as the switch from research to concepts to actual art-making.) But I think this card also represents the theme of my art show. I am creating works based on a specific time and place, a small town in Northern New Mexico that I visited five years ago. It was an experience very close to my heart, and something I've struggled to adequately express through words and images ever since. I think the card shows that this show is important to me because it is a way for me to look back at the past, ahead to my future (I'm hoping to continue this series of images and use the images to apply for arts grants) as well as the bridging of the two. This is something I've thought consciously about as I create the work, how I'm using new processes that I would not have used 5 years ago, and how my thoughts and experiences since that time have influenced how I look at those memories now. 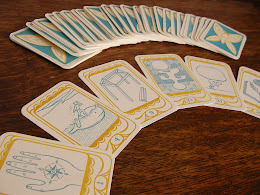 Moving on to the advice cards, the "Release" card shows a figure holding the sun, moon, and stars in one hand. I think this card has to do with control. I need to release the need to control my universe. I need to let things flow as they will. The card above it is the "Accept" card and shows a snake slithering over a hill. I think this card is telling me to get over that hump, to just proceed steadily and keep low to the earth. I think that at times I get lost in thought and speculation, and I really just need to keep working and not worry so much. I think this card is also poking fun at my "Internal Influence" card that showed vast mountains. Perhaps I'm making mountains out of molehills at times, and need to just keep a steady pace and stick to what's in front of me- one step, or slither, at a time. Card #34 shows a house on fire. I was not scared of that card. It signified my "Possible Outcome" and I thought of it as a card of purification, of "cleaning house." It seems significant that I have so many cards with the element of fire in them - the flower in the flame, the lightening bolt, and now this burning house. It made me remember that for me, the artwork I'm creating is very personal and getting it in the open is a form of catharsis for me. Maybe this means I will experience intense emotions, perhaps intensified anxiety, but I think in the end it is all for the best. Card #47 shows "Further Possibilities" and it confirms my feelings that the process I'm going through now is a way to bring my memories full circle, as much as memories can come full circle. The plants in this card go through a cycle of death and rebirth. There's more to the story of what these memories mean to me, but I'd like to keep some of it private. But I will say that these memories are a joyful beginning to a road that also led through much pain, and I think that the celebration of these memories will help me to release that pain. The last two cards in the upper right are the "Theme" cards for my reading. Card #36 flipped out of my deck while shuffling so I set it aside. It shows a boy with a sack, travelling light-heartedly. Card #15 shows a woman smiling. I think that both of these cards show that I need to relax and enjoy the process, that everything will work out and be okay. I can get so caught up in worrying and planning for the future. Every so often I will experience a moment where there is this incredible emptiness in my brain. It happens so rarely that it is immediately noticeable. This emptiness is saying "Nothing is wrong. There is nothing to worry about right now." That sounds kind of crazy, but I have an almost constant low-level anxiety that fills my thoughts and makes me worry about what I have to worry about next! I've been observing these thought processes, and I realize that it's not about what actually pops up in my life. It's about my state of mind. I know I need to find a way to relax and feel okay with life, but it is very hard for me to do. I've been like this for as long as I can remember. Maybe I should carry around the card with the smiling woman. Her face is very reassuring. Every time I panic that I don't have the energy or capacity to do what I need to, I need to pull the card out, take a deep breath, and trust in her smile.